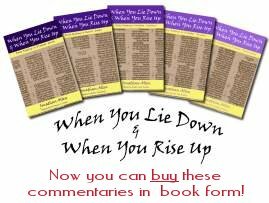 Shemot/Exodus 12:31-32 Get up! Get out from amongst my people ... and bless me as well! Ramban puts this explanation in Pharaoh's mouth: "It is a royal command that you leave immediately - I will not give permission for any of you to remain among my people, who are being killed on your account." Pharaoh is speaking, of course, to Moshe and Aharon whom he has summoned in the middle of the night after the last and most terrible of the ten plagues has been executed: the death of the firstborn throughout Egypt. There is not a house without a death and Pharaoh - who we assume has also lost his firstborn, his son and heir - is desperate now to get rid the Israelites before anything worse can happen. As Hirsch succinctly comments, "'Get out from amongst my people' is a complete permanent going away." Baal HaTurim points out that the first two words appear together in this way only twice in the Hebrew Scriptures:2 here, "Get up, go out from among my people" and in the words of the Lot to his sons-in-law on the night before Sodom was destroyed: " Get up, go out this place" (B'resheet 19:14). Imperatives are used again the next morning, this time spoken by the angels to Lot: " Get up, take your wife" (v. 15). The Baal HaTurim draws the parallel that "just as the angels had to forcibly remove Lot and his family from Sodom, here too the Egyptians forcibly ejected the Israelites from Egypt." As we can see from his whole speech - "Up, depart from among my people, you and the Israelites with you! Go, worship the L-RD as you said! Take also your flocks and your herds, as you said, and begone! And may you bring a blessing upon me also!" (Shemot 12:31-32, JPS) - that Pharaoh has rescinded the various terms and conditions he had previously tried to impose. The JPS translation "you and the Israelites" hides the original text: "you and the Children of Israel" that, because there has never been a suggestion either that Moshe and Aharon should go without the people, or that they themselves would be left behind, is taken to mean "you - the adults - and the Children of Israel - and your children". Not only can Moshe and Aharon lead the entire people out of Egypt, adults and children, but they are to take their flocks and herds with them and leave the country as quickly as possible. Rashi who gives Pharaoh a very direct reason: "Pray for me that I should not die for I am a firstborn." Rashbam simply re-orders the words - "May you also bring a blessing upon me" - leading Michael Carasik to comment that, "Pharaoh is asking that they go, and also bring a blessing upon him - not that they bring a blessing upon themselves and upon him also." On the other hand, more modern scholars suggest that this request - although not actually answered, only implied - sets an "end of the era" in the text. Cassuto offers, "At the very end there is a word of blessing. The first meeting of the old patriarch Israel with the king of Egypt was marked by benison. Possibly the Bible wished to allude thereby to what G-d had said to Avraham when he was first chosen, 'and in you will be blessed all the families of the earth' (B'resheet 12:3)." Gunther Plaut is more explicit: "Pharaoh now acknowledges that G-d has dominion over him. The first meeting of a pharaoh with Ya'akov, upon his arrival in Egypt, had brought words of blessing (47:7,10), and so does the last - with Moshe, upon this departure from Egypt." This - if it were fulfilled - would bracket the whole Egyptian episode from Israel, as opposed to Yosef, entering Egypt until they departed. Blessings can bring a sea-change, starting new periods and relationships as well as ending old times. The Greek Scriptures have no equivalent phrases using the verbs "to rise" and "to go out". Rav Sha'ul is told to "rise, and enter the city" (Acts 9:6, NASB) at the end of his encounter with the risen Yeshua on the road to Damascus; an angel tells Peter to "Get up quickly" (12:7, NASB) when he is released from Herod's prison, and Sha'ul has a vision in Jerusalem where he hears Yeshua telling him to "Make haste, and get out of Jerusalem quickly" (22:18, NASB). Instructions to bless can be found; Yeshua tells the disciples to "bless those who curse you" (Luke 6:28, NASB), echoed by Rav Shaul - "Bless those who persecute you; bless and curse not" (Romans 12:4, NASB) - who on his own account recounts some of the rigours of the missionary life: "when we are reviled, we bless" (1 Corinthians 4:12, NASB). To bless, then, is to wish G-d's favour upon someone, in a religious context to pronounce ritual words invoking G-d's name over someone for good, to call down healing or resources for someone - it is asking G-d to do something for or give something to someone in an authoritative way, rather than simply praying for them. Aharon was given specific words with which he and his sons were to bless Israel: "The L-RD bless you, and keep you; the L-RD make His face shine on you, and be gracious to you; the L-RD lift up His countenance on you, and give you peace" (B'Midbar 6:24-26, NASB). Formally, the cohanim bless Israel three times each year at the Western Wall in Jerusalem; they lift their hands towards the assembled Jewish people and solemnly intone the blessing formula to a traditional tune. An individual cohen may pronounce the blessing in synagogue on Shabbat; rabbis will similarly bless congregations and gatherings using the same words. The words are in a grammatical form known as 'jussive'; a sort of third-person imperative. We cannot command G-d to bless others, so we say "May He bless ..." or "Let Him bless ..." This is as close as we can come to telling G-d what to do: invoking His name and asking. Most blessings - asking our G-d to give something, even if only as intangible as a sense of peace, to someone - are usually well received. Non-religious people will often accept a blessing as a gesture of goodwill from someone who does believe. They seem to recognise that it is important and valuable to us so although they don't believe it, they will receive the intention. Even those who reject the gospel may finish their sentence with words such as, "but you can pray for me," or "but I won't refuse a blessing." We need to be more generous with our words of blessing - which don't have to be formal or posey - to build bridges and open doors for G-d to work in people's lives through our words. This can open a new season and close an old unproductive season - allowing the gospel to work or for the Spirit to bring growth after a time of stagnation. There is a spark of G-d in all people, for we are all made in His image, however distorted or hidden that has become, and a blessing is one way that the Spirit can blow a little oxygen across that spark to encourage it to glow and even catch fire. Next time someone tells you to "Get up! Get out! ", see if you can turn that into blessing and waft a little spiritual oxygen into their lives. Be genuine; see them through Yeshua's eyes and speak His words of blessing and peace into their lives, almost without them realising. Use appropriate language and tone so that it doesn't sound sarcastic or as if it were really a curse in disguise. Then pray and wait and see what G-d does! 2. - The same verbs are used as singular imperatives in Ezekiel 3:22 - , when Ezekiel is told to, "Get up, go to the plain" to hear G-d's word. Application: What do you do or say when people get a bit tetchy with you or even shower you with unwanted invective? Why not see - without being flippant or patronising - if you can turn that into an opportunity for blessing them! 17:56 13Jan16 Tom Hiney: I think it is better to bless them and pray for them silently. The only one who matters will hear the prayer and only HE can do anything about it.